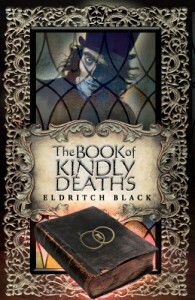 The Book of Kindly Deaths is currently free for the Kindle version. If you like MG Fantasy I highly suggest you grab this one. The blurb: Eliza Winter's whole world is turned upside down when she discovers a hidden room in her missing grandfather's sprawling Gothic house. Inside the room, below a stained glass window where moonlight shines no matter the hour, waits The Book of Kindly Deaths. When a sinister man claiming to be a book collector arrives at the house, Eliza realizes there's far more at stake than she could have ever imagined. Now Eliza must battle her darkest fears to save her family from the book's guardian, the terrifying ghoul Grim Shivers. Soon she is forced to travel into the heart of the Grimwytch, a haunted world of terrifying monsters where it's forever midnight. Mix together and sprinkle lightly with gruesome details. "On a desk in the room with the stained glass windows sat a book. It was a thick volume with a worn and cracked black cover showing a gold symbol, a rectangle within two circles that sparkled and flickered as if teased by ghostly fingers. Voices whispered from inside the book, growing in volume, a few human, a few not." Poor Eliza has a dreary mother, one of those practical sorts who doesn't allow things like imagination and curiosity. I already know I don't like her much. But perhaps she does have reasons for this sad flaw. Twelve year old Eliza has come with her parents to clean out her grandfather's house and catalog things of value. As her grandfather is missing this seems a bit odd and perhaps slightly premature. As Eliza reads some of the stories in The Book of Kindly Deaths there are clues these might not be simply stories. Including a strange memory she has of the last visit to her grandparent’s home six years before when she was only six. "The phantom of a forgotten memory crossed her mind. A ghost of an event that had occurred the last time she was at this house. Although the recollection was fleeting, she still felt an icy sting of dread." After Eliza, and we the readers, are treated to some tales from The Book of Kindly Deaths, where we learn a bit about the denizens of a place full of nightmarish creatures called Grimwytch, Eliza comes to be in immediate danger and finds herself in Grimwytch. There she finds both villains and allies, and learns what happened to her grandfather. This book has that dark fairytale vibe, and stories within the story. The writing is descriptive and deliciously creepy. There are a few mildly gruesome bits, but nothing I’d hesitate a middle grade reader reading, as long as they enjoy dark and creepy stories. Young people who delight in spooky tales will eat this one up. I also think people older than Middle Grade will enjoy this one. I’m an adult and I sure did. I very much hope there are more stories of Eliza to come.